Dominick Ruggieri started his Kung Fu training in Spring of 1983 at the age of 23 years old. His first class was at Brookdale Community College were he took a Tai Chi and Shaolin class which was offered on the same night. Prior to this, he had no martial arts training. After completing this 8 week community education class, he continued to practice what he had learned on his own until the end of that summer. Then, in September of the year, he started private study with Patrick Hanvey and Mark Gates. His main style of practice was Northern Shaolin Long Fist. 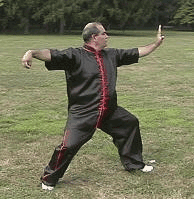 After completing this material, he then continued on to study Tai Chi Chuan, Pa Kua Chuan, Hsing Yi Chuan, and Qigong. After completing Shaolin training with Pat and Mark, Dominick was introduced to Sifu Randy Elia of Peter Kwoks Kung Fu Academy in February of 1993, where he then continued his training in Northern Shaolin Chuan and internal practices. In July of 1990 Dominick became a full partner of the Academy and began instructing students on behalf of the Academy. The Academy was a part-time endeavor in addition to his full time regular job. Then in March of 1993, he opened his own location in Brick, New Jersey to the teach arts which he had learned. In September of 1998, Dominick left his full time position to embark on a new career in providing Kung Fu training on a full time basis to all those who wished to learn.